A great looking Formtec Pro 7, the newest version is well designed for design and printing various Formtec papers for printing. Formtec Pro 7 supports Making address book and Managing data for labeling, outstanding DB compatible function such as Excel, Access data file, previous Formtec Pro6 data file and Editing and Printing various designs and different contents on one screen. All these useful functions are upgraded for better customer satisfaction. * Cliparts and Help contents are not included in the download version on this website. 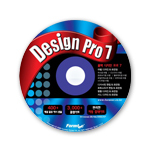 Formtec Design PRO 7 is in efficient use to print various kinds of Formtec labels - Address, Shipping, File Folder, Barcode, Name Badge, CD/DVD andMedia. Simply design and apply to a wide range on your needs. Just print, Feel convenience! Your own unique and attractive Business cards will be created in Formtec Design PRO 7. Image insert, special text edit and other functions will make you surprise in making business cards. Also Formtec Design PRO 7 provides sample designs for your convenience. 2,000 clip arts and lovely sample designs help you make charming and valuable cards. Your recipients will be impressed with your sincerity. Formtec Design PRO 7 is providing optimal designing tools to make new postcards. Any kinds of image files can be printed and edited with your message in the Formtec Design PRO 7. The screen, Graphic User Interface is optimized for customer use. And the background color has been applied to the program for a new ,elegant and convenient look. Design Pro 7 makes it easy to create great looking labels. When you want to print different designs and contents in individual label space of one sheet at once, you can edit and print as you want on one screen very easily. To modify the program or add features, you do not need delete existing program. You can apply updates quickly and download a sample design if it is not installed. You can work on the data on one screen. Users will have no difficulty working with the data, which used to be the most difficult task in creating labels. The existing editing feature has been made easier to use. A few fun features have also been added to ensure convenience of users. Printer and printing scope settings can be specified in one page for the fast and easy printing of labels. If you installed the program using the DesignPro 7 Installation CD, you will be provided with 2,000 cliparts as well as 200 new sample designs. You can also edit the labels easily and conveniently. * Cliparts are not included in this download version.